Voir les événements à l&apos;affiche. Access to PhD thesis, Habilitations and publications. • and the spectroscopy of very heavy nuclei (region of transfermium nuclei and beyond). 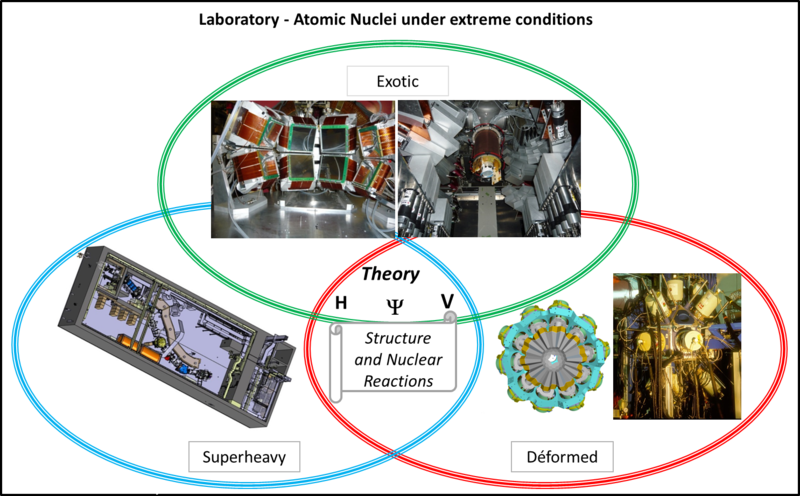 The LENA Nuclear Structure Theory Group develops models that aim to extend our understanding of the emergence of nuclear phenomena based on theories of low-energy nuclear interactions. In particular, the scope is to develop a complete interpretation of the experimental results on the nuclear chart by carrying out ab initio calculations. Exotic nuclei are studied by nuclear reactions induced with stable (GANIL, Jyväskylä) or radioactive beams (SPIRAL at GANIL, RIBF at the Nishina Center of RIKEN in Japan). - at GANIL we use the VAMOS magnetic spectrometer, the EXOGAM detector for gamma spectrometry, or the MUST2 telescope array for the detection of light recoil particles, projects for which IRFU contributed strongly in the 2000s -2010. - at RIKEN we use the MINOS detector, developed by IRFU, in coincidence with the gamma spectrometer DALI2, to study the spectroscopy of the very rare exotic nuclei produced by the RIBF facility. Structure of the LENA groups and view of devices used for scientific programs. EURISOL, European machine for the second generation of radioactive beams. The experiments envisaged with the stable and radioactive ion beams produced by the new generation machines require the design and realization of detection instruments with increased performances. Programs have been developed in recent years to build detectors that will replace current spectrometers and telescopes. the cryogenic H2 reaction target CHyMENE (A Thin HYdrogen Cryogenic target for the study of Exotic Nucleus).